National Fire Protection Association reports that around 33 percent of home fire injuries are a result of leaving cooking equipment unattended. You won't have to worry about that with the help of CookStop. Our automatic stove shut off device will activate before your stove even has a chance to get out of hand. CookStop™ is ready to use right out of the box, or it can be configured to fit perfectly in any living environment. It can easily be installed in elderly care establishments, college dormitories, independent living facilities, and single and multi-family homes. 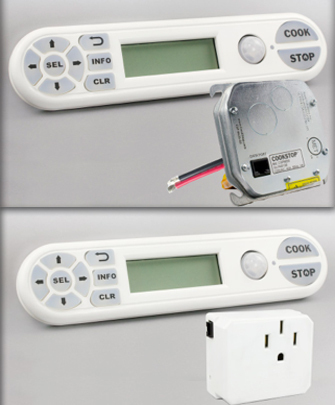 With each CookStop™, we provide the right power supply to connect the device to your electric stove without needing to alter your stove at all. Our fire prevention product uses motion sensors while you are cooking in the kitchen. When CookStop™ senses that you have left the kitchen, it begins a countdown to shut off the stove. Coming back into the kitchen to check on your cooking will automatically reset the device's countdown. If you forget that you have left the stove on, CookStop™ will automatically shut off the stove for you. Is Your Stove Powered By Three-Wire, Four-Wire, Or Direct Wire? Is Your Stove Gas Or Electric? Whether your home is new or old, CookStop can easily and conveniently fit into your kitchen or living facility. We support three-wire, four-wire, and direct wire stove power connections. If you are unsure how your stove connects to your home power, please contact your facilities manager or contact us. At this time, CookStop does not work with gas stoves. However, we are working hard to develop a new model that will accommodate gas stoves.